Budget destinations are a must for nearly all travellers these days. Take a look at this ultimate list of budget destinations to get stuck into without breaking the bank! We want to ensure that everyone is getting the most out of their budget. This article is assuming that your budget is relatively low so in all of the following locations, you will be able to live for as low as US$15 a day. This includes everything from accommodation to food. Obviously, this low a budget does not give room for many paid activities during your time in these countries. Luckily, however, all of the following destinations will have things to do for free in order to stretch that backpacker budget even further. For each location, we have included prices and links for the best budget accommodation and food. We really are going to teach you how you can make the most out of your trip whilst also spending the least amount of money. What’s a good way to cut costs at airports? How do you deal with tip culture on a budget? How can I get into backpacking on a budget? This is a budget travellers paradise. So much so that we already have a complete post about all of the best budget accommodation in Cambodia. Check it out below! 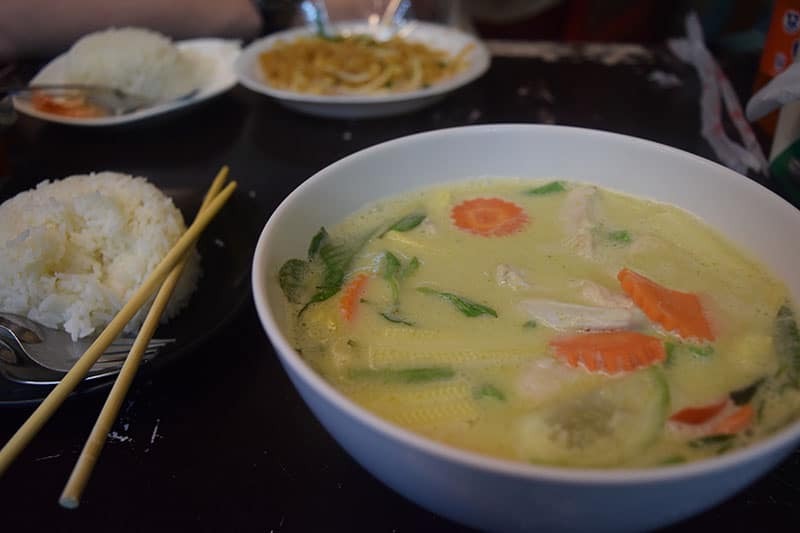 A typical curry and rice dish from either a street vendor or cheap local restaurant will cost you no more than US$2 per meal. And if you don’t want a full curry and rice every meal then this can easily be less. It tastes as good as it looks and the price is amazing too! Local transport in Cambodia is very similar to other South East Asian countries, the best way is Tuk Tuk’s. A local tuk-tuk will cost you on average of less than US$2 to get anywhere nearby. Tuk Tuk drivers in Cambodia have a tendency to push up the price of a ride if you look nervous or you are flashing some cash. I strongly advise haggling down if it is only US$1 here and there however if your driver is starting to ask for US$10+ then you are being ripped off by a long way. Do not accept this fare and simply move onto the next driver. There is always someone else willing to give you a reasonable price. Accommodation in Vietnam is some of the cheapest we have ever seen, Hanoi being probably the cheapest altogether. You can easily get a dorm room with a 9+ rating on booking.com for US$3. The best thing about this is that the rooms are actually amazing as well, very clean and very friendly staff. If you are travelling as a couple then it’s even better news for Vietnam. Let’s assume that your budget is doubled to US$30 a day because there is two of you. You can now get a private air-conditioned room for as little as US$10. Yes, you can get 2 beds in a dorm room for $6 but AC and privacy are not that far away! Vietnam is an absolute godsend for street food. You can pick up some banh mi (crusty baguette with choice of filling) for less than $1! Yes, less than a dollar. 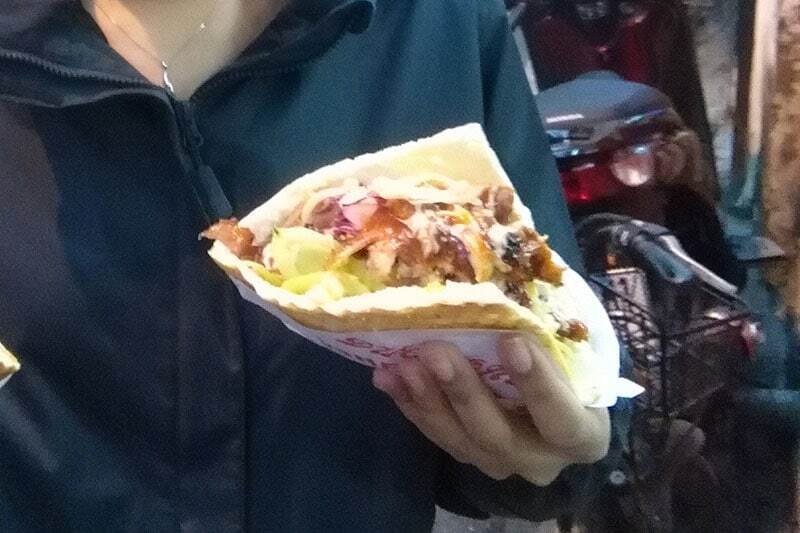 Let’s say you don’t want a banh mi, you can pick up a huge chicken kebab for $1. If you have a budget of $15 a day in Vietnam you will get fat. To make things worse there is a beer called Bia Hoi that is easy to pick up in the Old Town that costs 25cents a pint. Hanoi in Vietnam has to be one of the cheapest and most accessible places for any backpacker on a budget. This kebab cost $1. Enough said. You can jump on the back of a motorbike or have somewhere cycle you around the cities in a rickshaw. These vary in price but if you are only going around the city it shouldn’t cost a lot at all. It is going to have to be a personal decision whether or not you think it is worth the price for the distance you need to go. You don’t want to be ripped off but at the same time, we don’t want to rip off the locals too. If someone says I want to backpack on a budget, the first place that comes to mind is Thailand. There is a reason for the association to this amazing and cheap location. Some of the most expensive accommodation you are going to find is in the capital Bangkok. So when I say you can get a dorm room with breakfast included that is less than 1km from the centre of Bangkok for $4, you can understand why Thailand is a backpackers paradise. Wherever you go in Thailand there will be heaps of street food everywhere you look. Thailand sticks out from the other locations I have spoken about because there is such a variety on offer. There will be stalls selling Thai green curry and rice for less than $1 and there will be stalls selling Pad Thai for $1. Then next to these stalls there will pancakes, ice cream, bakery goods, seafood, bbq and so on. Pretty much everything costs $1! Another amazing curry but this time in Thailand. From all of the places we have gone, Thailand has the fastest and biggest tuk-tuks in Asia. Most other tuk-tuks are converted from small motorbikes, in Thailand, they are huge touring motorbikes that pull you along at ridiculous speeds. You can go anywhere in the whole city in these vehicles and you will get there quick. As always decide for yourself if you are paying a reasonable amount as distance and traffic can vastly change the price. Don’t rip off the driver and don’t be ripped off yourself. Compared to the other budget locations in this list Sri Lanka is a little more expensive for accommodation, especially in Colombo. However, I highly recommend that nobody should spend more than a day in Colombo. I have only ever heard bad things and when we were there for 6 hours it was one of the worst places I have been. Sri Lanka outside of the capital, however, is beautiful, simply stunning. Down in Mirissa on the south coast is as cheap for accommodation as anywhere we have travelled and you can pick up a private room in a guest house for as little as $4. There are many small things you can pick up as street food but they are all pretty average in Sri Lanka. 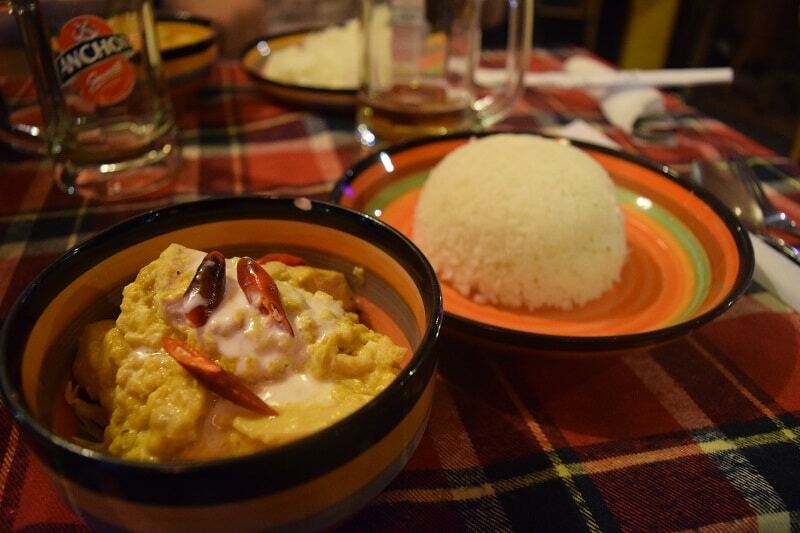 The best budget food in Sri Lanka is easily the Sri Lankan curry. You get a large bowl of steamed rice with up to 7 different curries piled up around it. It’s too much food really for one person but all of this costs as little as $2. The best thing about Sri Lankan curry has to be that every single different place you buy one the curry is different. It makes it easy to just buy the same thing over and over all the way around Sri Lanka. As usual, there are very cheap tuk-tuks to be found in any town throughout Sri Lanka. However, the best thing about transport here is that a 7-hour train journey might cost you $3.5. 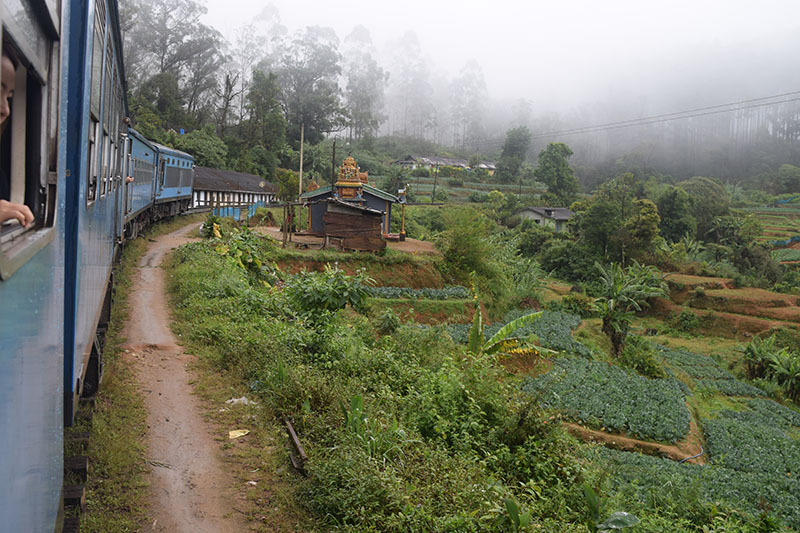 The train journey from Kandy to Ella is considered to be the best train journey in the whole world. Experience this for less than a quarter of your daily allowance. If you are paying more than $3 for a Sri Lankan curry then you are in the wrong place. You will be amazed how much nicer and cheaper the curries are if you go down a small road or walk to the end of the high street. Sitting on a plastic chair outside on the sidewalk is something that budget travellers will have to embrace and enjoy. 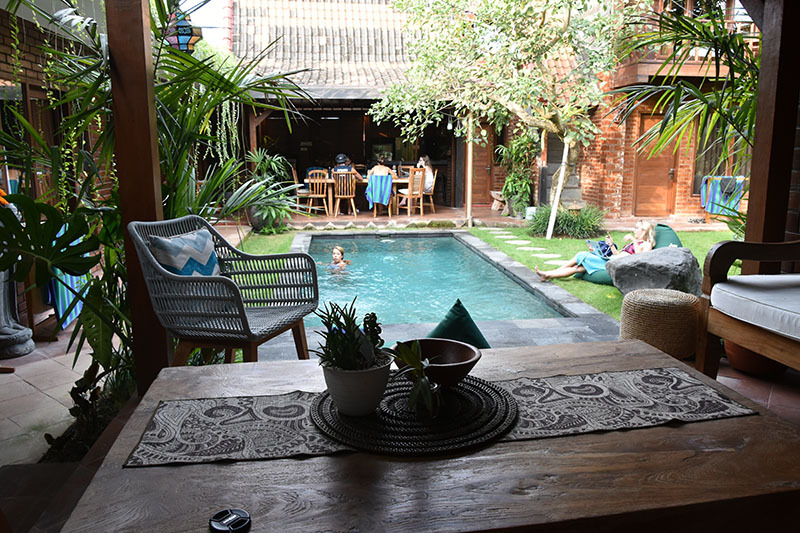 Bali is home to some of the most luxurious budget accommodation available to backpackers. Everything in Bali just seems to be so clean and beautiful on the inside. When you walk into your villa, after walking down a badly paved road with rubbish either side, you will be amazed at how nice the accommodation here is. I’m in Canggu as I’m writing this post and this is the view from my laptop. You can pick somewhere like this up for $4 a night and if you are thinking about coming to Canggu then I highly recommend Base Guest House. Probably the best place we have ever been for value and range. You can pick up anything you could ever possibly want for maximum $4, from Indian Cuisine to Mexican. Then you can pop down to a local restaurant (warung) and pick up a huge mixed curry for $1. If you live here you will never cook. If you do end up cooking then I salute your dedication to the cause because it is the easiest and nicest place to eat we have ever been. This cost us $3 and it is way too much food for one person. There are no tuk tuks in Bali but there are 1000’s of motorbikes. If you download the app GoJek then you can get someone to arrive on a bike with a helmet and transport you anywhere for a fee. Usually, it’s about $1 for a couple of miles so you’ll be getting around quickly and easily for a minimal fee. The vast majority of travel insurance companies DO NOT cover you if you have an accident whilst riding or on a motorbike. This INCLUDES mopeds. In your home country you probably have a licence to ride a 50cc motorbike without having a motorbike licence, however, all of the bikes in Bali are at least 125cc so you will not be covered if you do not have a full motorbike licence. I do not recommend getting GoJek bikes if this is the case but it is just as easy to get a GoJek car the exact same way for a little more money. In the capital, Beijing, you can pick up a dorm room in the center for $9 a night. This is a little more than the other countries I have listed but the tourism and sights to see in Northern China are simply incredible. From the Great Wall of China to the Forbidden City, this city is packed with places that will blow your mind. Food can be very hit and miss in Northern China, there will be a lot of tourist traps that try to make you taste ‘traditional Chinese food’. Things like scorpions on sticks and offal mush are nothing you should try. The Chinese don’t eat this sort of thing and if they do it certainly isn’t the norm in the North. However, if you know what to buy and where to go then suddenly you are opened into a world of $1 beers and amazing food. If you are in the south of China, for example, Guilin, the food is completely different. Most of it is fried noodles or rice with meat. It is much harder to buy something that you might not like in the south in my opinion. There are small tuk-tuks throughout China but I think the best option is just to get an official taxi. The rates are some of the best in the world and if you are in a taxi for over an our it might only cost you $15. You should be able to get wherever you want to go and still be around the $3 mark. Never buy drinks at an airport. Nearly every airport I have ever been to has free water available throughout. If you are going to be at a gate for a considerable amount of time then consider looking at all inclusive lounges. A meal and drinks at a restaurant could cost you $30 and a lounge might cost you the same or less for unlimited food, drink, internet and air conditioning. It might sound like a luxury but if you’ll be at the airport for more than 3 hours then you’ll almost certainly save money and have a much better time. Most importantly you have to research what the tipping culture is in a specific culture. In China and other Asian countries, it is offensive to tip as it is seen as you offering them charity. 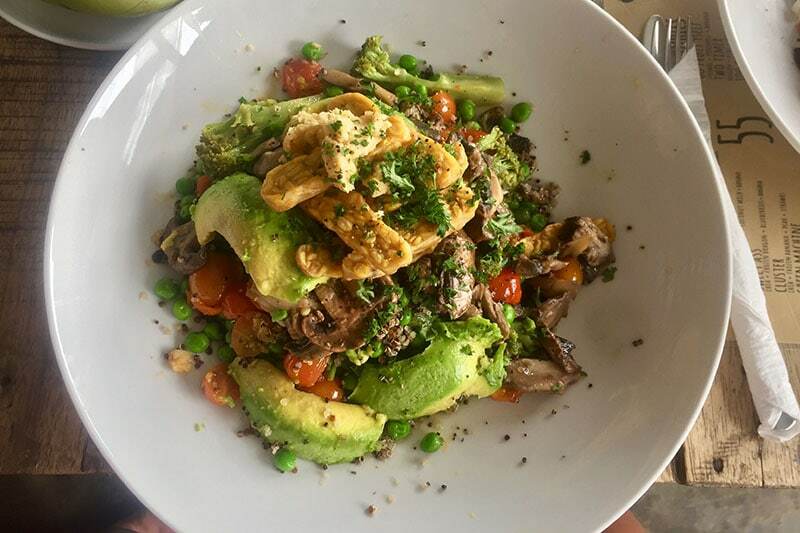 Don’t waste money tipping unnecessarily, it might be a serious cultural must in your home country but you have to remember you are on a budget and other cultures are very different. Try not to think about what you think you should pay in the country you are in. Understand that you should pay what you think it is worth. Try to compare the item or service to something you have paid before in your home country and decide whether it is worth it. If you think that it isn’t then offer them less than what you think it’s worth and slowly come back to the middle. The most important thing is not to get ripped off but also not to rip off the merchant. In nearly every circumstance you can both come away happy and this is the target. Buy a bag, choose one of the destinations on this list and go there. If you stick to the accommodation in this list and places that have been discussed then you will meet other people and be able to share tips and location for where you are. You will surprised how little you have to plan for budget locations.